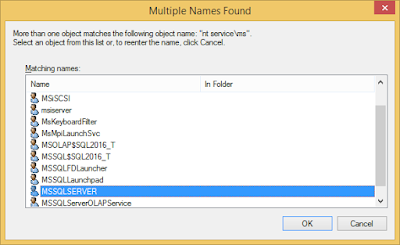 How to find NT Service\MSSQLSERVER and NT Service\SQLSERVERAGENT accounts? You have installed SQL Server and it is up and running without any issue. 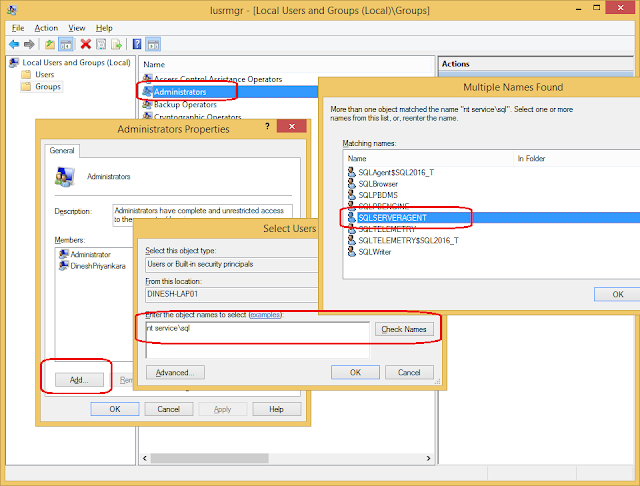 Later, you need to change some permission given to either SQL Server engine or agent. You look for accounts, searched in local users, searched in local groups but you cannot find them. Are you experiencing above issues? If yes, first understand the what are these accounts. These are called Virtual Accounts that are created during the installation of SQL Server. These accounts are managed by the Operating System itself, hence they are not visible when you browse Local Users and Groups window. Similarly, there is another type of accounts called Managed Service Accounts that are created at domain level and assigned to SQL Server services. 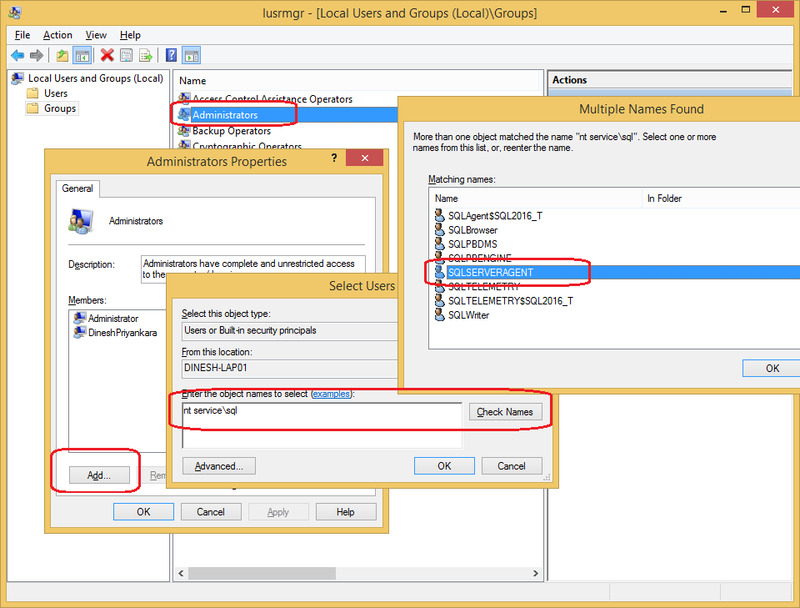 Now, for some reason, if you changed the service account of your SQL Server service to another account, and later you want to use the same Virtual Account, this is what you have to do. 1. Get the properties of the services. 2. Easiest way is, just type the account and leave the password blank. 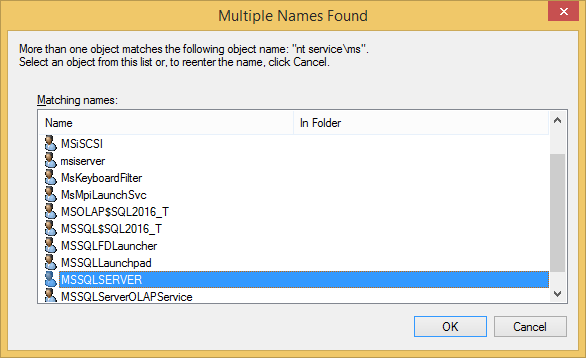 If the instance is default, type it as NT Service\MSSQLSERVER or if it is a named instance, type NT Service\MSSQL$. 3. Click on to get the service restarted. It will work as you expected. 4. 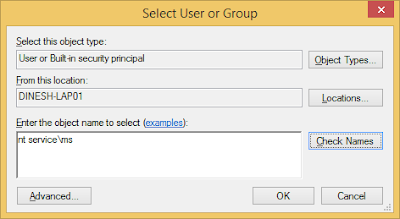 Or, if you want to search the account, click on Browse to open Select User or Group window. Type nt service\ms in Enter the object name to select input box and click on Check Names. If you are setting the Agent Service, look for nt service\sql word. 5. You get Multiple Names Found window opened. Select the account from the list and continue. Do not enter a password, click on OK and get the service restarted. Just like this, if you need to add these accounts to some other groups for granting more permissions, example, adding Agent Service Account to Administrators Group (not recommended), follow the same steps.